Kelantan is the federation's most conservative state. Situated in the country's northeast, with a coast on the South China Sea and sharing a border with Thailand, it has been run by the Islamic Party of Malaysia for almost 60 years. The population is overwhelmingly Malay, with a few Chinese and Indian residents and around 8,000 Buddhist Thais, the Orang-Siam. Kelantan was once under Siamese rule, and the Orang-Siam have lived here for hundreds of years. For a long time, Kelantan was isolated from the rest of Malaysia by the Titiwangsa mountain range that spanned the mainland peninsula from north to south. Travel to the state by land from the rest of the country used to take weeks. The sea was the easiest route, but often unsafe due to pirates and unpredictable weather. Kelantan's natives lived off the sea, and from the crops grown on the fertile plains along the Kelantan River, which flows through the state and out to the South China Sea. Kelantan's jungles teem with hardwoods, rubber and fruit trees. Even today, Kelantan's economy thrives on logging, fishing and farming. Kelantan's physical isolation is evidenced by the local tongue, a dialect called Kelantan Malay that many Malaysians outside of Kelantan might find hard to understand. The Orang-Siam's Thai is also different from dialects spoken in Thailand, especially in the South. 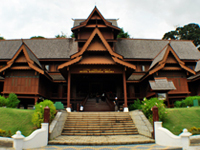 Kelantan's cottage crafts are similar to those in Thailand, such as wood-carving and batik-making. Its artistic traditions include wayang, or the distinctive shadow puppetry of some Southeast Asian countries, the use of huge drums called Rebana Ubi, folk singing called Dikir Barat, and a pre-Islamic dance form called Mak Yong. The giant kite called the wau bulan, or "moon kite", originated in Kelantan and is considered one of Malaysia's national symbols (along with the hibiscus and the kris). By tradition, only males fly these elaborately designed kites, which have crescent-shaped tails and floral motifs, and average 2.5 metres wide and 3.5 metres long. Farmers also used the wau bulan as scarecrows. The state is becoming a popular tourist destination, especially the south and the outlying islands. Kelantan's Royal City, Kota Bharu, has a popular central market and several shopping centres. Founded on the coast in the mid-19th century as the state capital, Kota Bharu was also declared a Bandar Raya Islam (Islamic City) in 2005, in line with the state government's policy to urge the Kelantan community to live the Islamic way in every aspect of their lives. The society is so strongly Islamic, even non-Muslim women cover themselves, and indecent attire is not allowed. But the people of Kelantan are known to be friendly and welcoming.